The Supreme Court of India on Thursday stated that a member of the disciplined force [CRPF in this Case], is expected to follow the rules, have control over his mind and passion, guard his instincts and feelings and not allow his feelings to fly in fancy. A Two Judge Bench of the Apex Court on Wednesday has held that a writ of Mandamus can be issued to authorities to grant remission. The Bench dismissed a writ petition preferred under Article 32 of Constitution of India, by the petitioners, who have been convicted for the offence punishable under Section 21 of the Narcotic Drugs and Psychotropic Substances Act, and sentenced to undergo rigorous imprisonment for more than 10 years and to pay a fine of Rs.1 lakh and in default of payment of fine, to suffer further rigorous imprisonment for 6 months, praying for issue of writ of mandamus to the authorities commanding them to grant remission to them as per the provisions contained in Chapter XIX of the New Punjab Jail Manual, 1996. Supreme Court on Wednesday refused to entertain a PIL seeking a ban on instant messaging application Whatsapp and asked petitioner and RTI activist Sudhir Yadav to approach the Department of Telecom, Information Technology ministry or TDSAT with his grievances. The Supreme Court held that that the appointments in respect of Fast Track Courts are ad hoc in nature and no right is to accrue to such recruits promoted/posted on ad hoc basis from the lower judiciary for the regular promotion on the basis of such appointment. The Supreme Court held that the expression “other proceedings” in Section 69(3) of the Partnership Act does not include Arbitration Proceedings and the ban imposed under the said Section to can have no application to Arbitral proceedings as well as the Arbitration Award. Division Bench, allowing the appeal against the High Court judgment, also held that Section 35 and 36 of the Arbitration and Conciliation Act, 1996 is specifically restricted to treat the Award as a decree of a Court and does not equate Arbitration proceedings with court proceedings. A two Judge Bench of the Supreme Court held that the Supreme Court cannot appreciate the entire evidence de novo in a routine manner while hearing Criminal Appeals, and that too when the conviction is based on concurrent findings of two courts. The Supreme Court of India allowed Bar Council of India three more months for completing “verification” Process of Advocates under Certificate and Place of Practice (Verification) Rules 2015, by three months. The Supreme Court of India ruled that provisions of Sick Industrial Companies (Special Provisions) Act, 1985 would prevail over the provisions of the companies act. Supreme Court on Friday issued notices to CBI, SEBI, RBI and the Finance Ministry for a direction to seize entire investments and gains made through participatory notes in India. Supreme Court of India on Wednesday has slammed the colleges admitting students without affiliation terming that “this kind of conduct has become a disease, and when the conduct becomes a disaster, it is a disastrous phenomenon”. Supreme Court of India on Wednesday held that a Judge cannot assume the power on the basis of his individual perception or notion. A two judge bench of the Supreme Court on Wednesday refused immediate hearing to celebrities chef RituDalmia, hotelier Aman Nath and dancer N S Johar who approached the Supreme Court seeking quashing of section 377 of the IPC which criminalises homosexuality and said it would place the fresh plea before the bench headed by Chief Justice T S Thakur who may take a call if to hear it separately or tagged along with curative petitions by Naz Foundation and others to be heard by a constitution bench. Supreme Court on Thursday clarified that gays and lesbians will not get benefit under the OBC category as they are not included in the definition of ‘third gender’ like the Transgenders. No official can put forth a claim that breach of trust is connected with his official duty, the Apex court bench observed while allowing an appeal by setting aside a judgment by the High Court wherein it had held that when other offences are interlinked with an offence under Section 409 IPC sanction under Section 197 IPC for launching the prosecution for the offence under Section 409 IPC is a condition precedent. The Apex Court said that such an approach is absolutely fallacious. Supreme Court re-iterated that a right to file first appeal against the decree under Section 96 of the Civil Procedure Code is a valuable legal right of the litigant. The Court also stated that the jurisdiction of the first appellate Court while hearing the first appeal is very wide like that of the Trial Court and it is open to the appellant to attack all findings of fact or/and of law in first appeal. A two Judge Bench of the Supreme Court allowed the 2008 Bangaluru Blast Case Accused Abdul NazirMaudany to visit his ailing mother in Kerala. 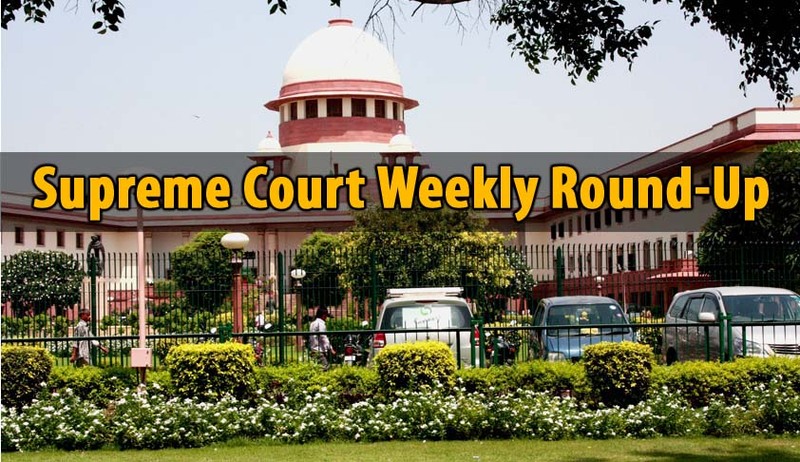 The Bench comprising of Justices S.A Bobde and Ashok Bhushan has also directed the trial Court to dispose of the trial as expeditiously as possible. The Supreme Court set aside the punishment of life imprisonment imposed on a person convicted for murder, by holding him to be juvenile in terms of the Juvenile Justice Act, 2000, as on the day of occurrence. The Supreme Court in State of Rajasthan vs. Jag Raj Singh @ Hansa, held that like Section 42(1) and Section 42(2) of Narcotic Drugs and Psychotropic Substances Act, vitiates the Conviction under the said Act. Taking ahead its hearing on batch of petitions, one of them taken Suo motu by it on the contentious issue and recurring complaints of gender discrimination suffered by Muslim women arising out of several rules in its personal laws like triple talaq and polygamy, the Supreme Court on Wednesday asked all parties including the Centre and All India Muslim Personal Board to frame legal propositions requiring consideration. Supreme Court on Wednesday issued notice in a PIL filed by Dr Naresh Chand Gupta seeking Guidelines to monitor and control ill effects of radiation (Radio Frequency Radiation or RFR) from cell phones and towers in humans and animals.